Meatless Mondays can now extend into Tuesday, Wednesday, Thursday and Friday thanks to Sun Basket’s vegan meals. Eating well while going vegan seems to be challenging for many people I’ve talked with. They get all excited to go vegan, and then… they can’t seem to figure out what to make. Honestly, I can understand this myself as a mom with a busy work schedule and three kids. Sometimes you just want healthy, and you want it easy, and you want it delicious. You definitely don’t want to pick up veggie burritos for dinner one more time. I hear you. Sun Basket’s home delivery takes the decision making out of the “what’s for dinner?” and gives you tasty meals to make without any fuss. Every week you can have fresh new recipes to try out. You’d think that someone like me, a vegan chef who creates recipes, wouldn’t need this service, but really, I do need it (because hey, I’m a busy mom over here). I welcome the inventive menus to my kitchen and table gladly. Please scroll down for my special Sun Basket coupon and Get $80 OFF YOUR FIRST MONTH. For one thing, Sun Basket’s packaging was done as eco-friendly as possible. They provided everything in boxes packed with recycled materials, plus the cold pack was 100% biodegradable. Each recipe was labeled clearly in each box. I had ordered the family size vegan meals for the week, and whoa. There was a lot of food on my doorstep! I didn't have to think about what to make for lunch or dinner. Out of the three meals for the week, I really loved the Spicy Yuba Noodle Stir Fry. Hodo’s hand-cut yuba noodle strips are tossed in a spicy teriyaki sauce, packaged especially for Sun Basket delivery. Kinda cool that you can try out and discover a plant-based brand while making your meatless Sun Basket meal. 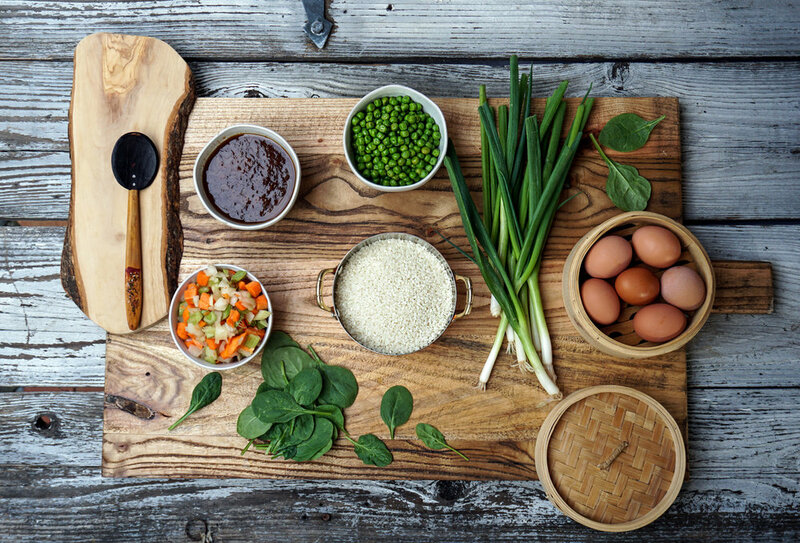 All of the ingredients for the Yuba Noodle dish were very easy to find and create along with the simply laid out recipe format. It mentions that the dish is: Dairy-Free, Vegan, Gluten-Free, Spicy, Diabetes-Friendly. I had fun prepping this dish and putting it all together. The Sun Basket guide outlines all of the ingredients and clearly explains what you’ll need to make the recipe. The prep and cook guidelines are quite simple to follow. You can also add your own flair to each dish if you feel like getting creative. This recipe came with shredded cabbage, sweet mini peppers, organic mangoes, sugar snap peas, shredded carrots, shelled edamame, the yuba noodles, black sesame seeds, and citrus-miso dressing. This week’s culinary theme was “Spring in Bloom” which featured a Japanese style meal with cherry blossoms. The featured ingredient information on the Japanese pantry was a nice touch: baby boy choy, dried shiitake mushrooms, ginger, kombu, mirin rice wine, miso, ramen noodles, sesame seeds and oil, shichimi togarashi, soy milk, tamari, and tofu are the highlight ingredients listed. A whimsical page insert shows Japanese people enjoying the sakura (cherry blossoms) in a park, while explaining that enjoying the blooms during the sakura matsuri festival, it is traditional to eat and drink beneath the cherry blossom trees, known as hanami. Actually, “hanami” translates to “flower watching” in direct expression. As I do speak and understand Japanese a little bit, as well as write and read hiragana (the phonetic syllabary), I appreciated the explanation that Sun Basket gave in their glossy guide. They tie in the food culture and recipes with their lovely design of the week’s recipes in this guide, of course. You can serve the yuba noodle dish in a large family style serving bowl, or small bowls for individual servings. The other recipes were also easy to fix and make, but I have to say, the tofu skin yuba noodles were a big hit. 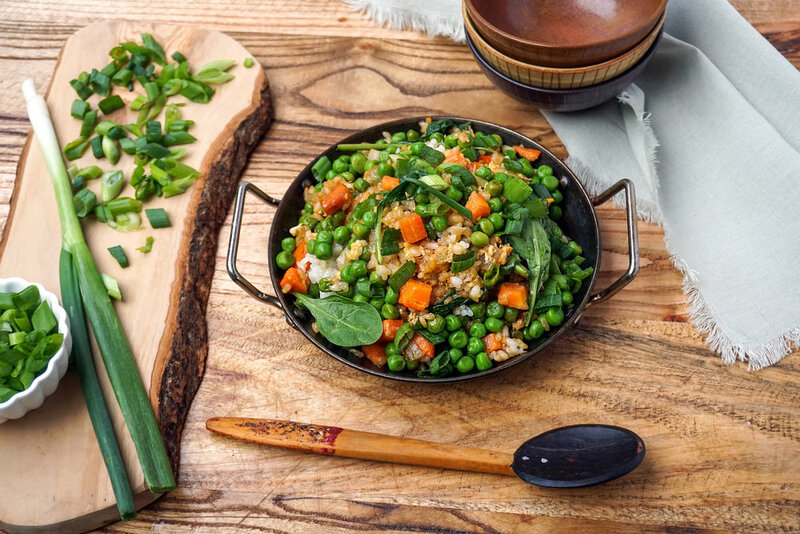 We also tried the Japanese chahan fried rice with peas and spinach — for me, sans the eggs. Of course, you can make this vegetarian with the eggs in the stir fried rice. As I’m used to making fried rice, I tend to wait a day for to make it after cooking the rice, as I find that method better. The sushi rice is a nice flavor, but must be careful not to overcook sushi rice or it will turn into a gloppy mess. I’ve learned my lesson many times over, so I kept my eye and slotted spoon at the ready to make sure I didn’t overcook the rice. My personal method is to cool the rice before stir frying it, and yes, once again, I tend to wait a day. The reason is that the rice is better to stir fry once cooked and cooled down in the fridge overnight. Just my own way of doing it. Usually most Asian families understand this because stir fried rice is sort of a repurposing of leftover rice. I did receive the eggs for the fried rice, as Japanese fried rice tends to have egg in it. That was fine with us, as I made one batch vegan, and one batch vegetarian (with egg). Both my oldest son and youngest daughter love their fried rice with egg, so we all enjoyed this meal together by separating the fried rice in two different side-by-side batches. The Rainbow Asian Salad kept up with the Asian ingredients, and although I don’t consider this salad quite Japanese, the freshness of its flavor maintained the springtime theme. The salad comes with a light tamarind cashew dressing, spinach, cabbage, dry-roasted cashews, and a nutty, black sesame-cilantro garnish. The salad is much more of a Thai style flavor profile, but I’m quite partial to Thai food, having grown up in Los Angeles next to the Thai Town neighborhood. Maybe the tamarind dressing and cashews made me think of Thai. The Japanese match to this might be yuzu instead of tamarind dressing. Nevertheless, this salad is a lovely compliment to your Sun Basket meal. The sides I chose with each recipe were my own, and went along with our featured Sun Basket recipes. If you’re already sold on trying Sun Basket, here’s my special offer for you. Sun Basket definitely makes an effort to cater their recipes to the vegan palate. I’d highly recommend a read through their most loved vegan meals for an idea of what you’ll get in your Sun Basket delivery. I like that the selections are well thought out and encompass more of a world cuisine rather than just the basics. I think this meal delivery service is worth the cost, which is affordable, with the classic menu at about $11.99 per serving, suitable for 2-4 people. You can choose how many recipes per week and there’s no locked in commitment if you don’t want to order every week. The family menu is more my speed, and we got a lot of food in our week’s order. I’m talking three big boxes! I considered getting an extra fridge in my house as I was almost out of room to store everything in one fridge, including my own weekly groceries. The family menu will also give your kids a chance to cook along with you. You definitely will enjoy cooking more at home and sharing the meals. Sun Basket even gave me some new inspiration as a recipe and content creator, which took the pressure off me cooking for my family. Even though this is a sponsored post, I’m very honest in sharing this with you, as I only support brands that I fully believe in. This one rates high on my level of expertise! I hope you’ll try Sun Basket. You can get $20 off your first four shipments through my special link! Use this link to get $80 off your first month’s deliveries!